Welcome to Plum Tree Cottage. If you want somewhere rather special for your stay in Swanage, then look no further. 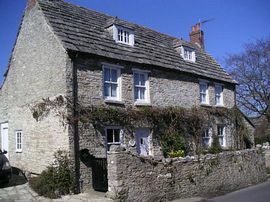 Built over 200 years ago of Purbeck stone, Plum Tree Cottage is full of charm and character, and retains many of its original features. Plum Tree Cottage is ideal for family holidays, and pets are welcome too. 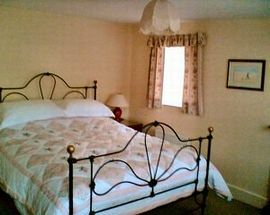 The cottage comfortably sleeps 8, in two double rooms and two twin rooms. The rest of the accommodation comprises three bathrooms/shower rooms, a spacious lounge and separate dining room, a conservatory and a fully fitted kitchen overlooking the beautiful enclosed garden, patio and outside dining area. The cottage has central heating in addition to the wood burning stoves located in the reception rooms, making it cosy all year round. It is comfortably furnished and fully equipped to make your holiday as relaxing and care-free as possible. Utilities, fresh bedding and towels are included in the hire. There is ample off road parking and secure bicycle storage. Within easy reach of SW Coastal Path and open countryside. 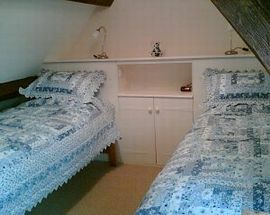 All bed linen, pillows, duvets, quilts and towels are provided and included in the price. 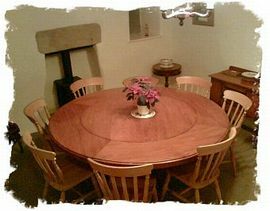 Pets are welcome and there is a small charge of £20 per pet in addition to the cost of hiring the cottage. There is an enclosed garden with patio and outside dining area. Local Services: Post office/convenience store, pubs, take away restaurants are within 5 minutes walk. Further pubs, restaurants, beaches and local amenities are about 10-15 minutes walk away in Swanage town centre. From A35 on A351 via Wareham to Swanage. Turn right into Bell Street at junction of High Street and Victoria Avenue. Plum Tree Cottage is 400 yards along on right. From Poole or Wareham Rail stations take 142/143 bus to Herston Cross. Bell Street is by crossroads (Victoria Avenue/High Street) Plum Tree Cottage is 400 yards along on right. May Spring Bank Holiday: £1,220. Christmas and New Year: £1,390. 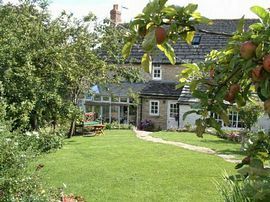 Plum Tree Cottage is available all year round.